Above are a few JudoPhotos magazine front covers from Austria, Germany, Great Britain, Holland and the USA. The front cover to the Olympic edition of Judo Crazy magazine with the friendly front cover picture of Olympic champion Majlinda Kelmendi of Kosovo and her coach Kuka and the silver medallist, Odette Giuffrida of Italy. The 2017 Warsaw Europeans Opening Ceremony reported in the German 'Judo Magazin'. A Judophotos 1975 picture from the Vienna World Judo Championships used on the 1997 Slovenia stamp to promote the Ljubjana Junior European Championships that took place that year. The amazing "Harry Houdini" Rio Olympic escape by Great Britain's Sally Conway from a hold by World champion, Gevrise Emane France. Conway then held Emane for ippon on her way to the Olympic bronze medal. December 2000 German Judo Magazin front cover showing Anna-Maria Gradante with her Sydney Olympic bronze medal and two team mates with Sydney Harbour bridge in the background. The picture was taken on board the MS Deutschland. The 2012 Budokwai booklet and the club's links to Olympic Judo since 1964 when Budokwai members, Syd Hoare, Tony Sweeney and George Kerr participated in the Tokyo Olympic Games. (Originally Judo Photos Unlimited in the analogue era) was created by David Finch as a judo editorial stock photo library and has been in existence since 1973 recording British Judo since 1971, European Judo since 1974, World Judo since 1973 and Olympic Judo since 1980. Currently Judophotos.com contributes to several international judo publications in Europe and around the world and has contributed to considerably more than 100 judo books, the latest being "Judo Evolution" by Neil Adams MBE and Oon Yeoh. It was published in December 2011 by Ippon Books, a subsidary of Fighting Films. Other 2011 projects included pictures reproduced in the Internationa Judo Federation's (IJF) 60th Anniversary book and displayed at two metres tall in the Lausanne Olympic Museum. 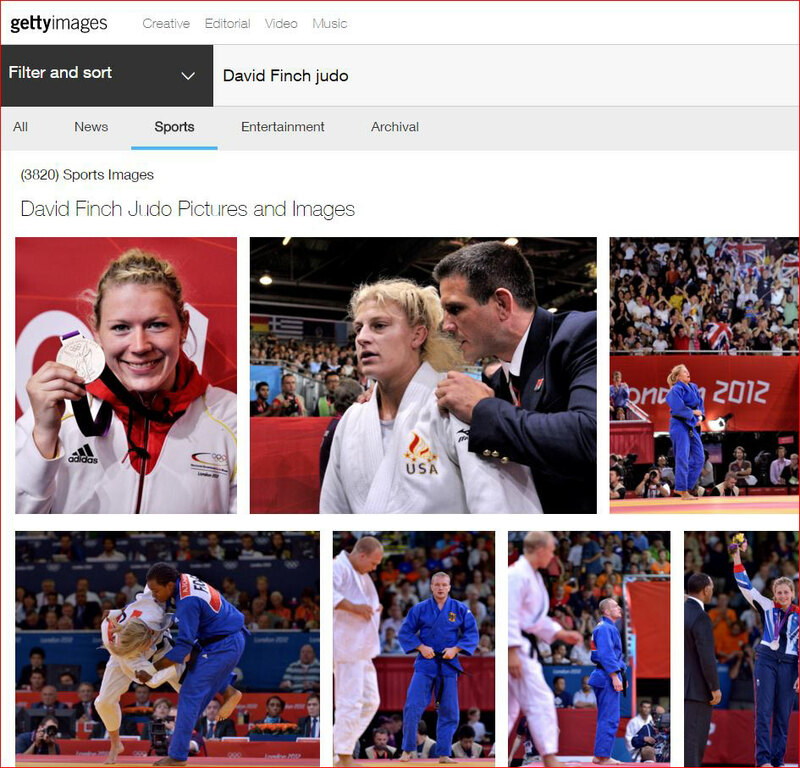 Often images are supplied from stock to illustrate editorial articles ranging from judo etiquette and personalities to illustrations of techniques, styles of judo or competition sequences etc. 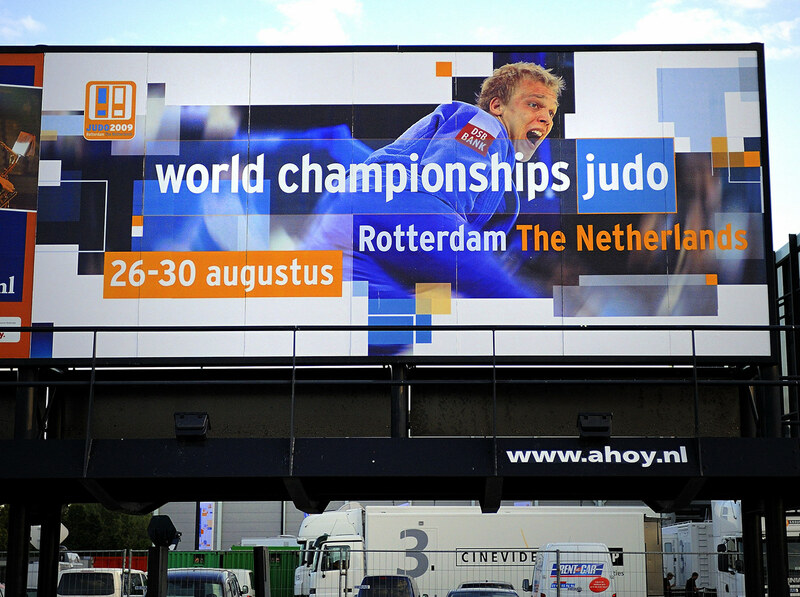 See some of the pictures used as front covers, giant posters, stamps and on coaches and vans at www.judophotos.com. A few of these are displayed below. Current January 2012 ventures include supplying 500 images for a Russian judo website and a future A3 coffee table book on Judo Champions and printed in three languages. Member of the Sports Journalists Association since 1975 and the Association International Presse Sportif (AIPS) since 1979. Also, one of the 100 British photographers accredited for London 2012 and winner of the inaugural AIPS Judo Media Photographer Award presented at the 2011 Paris World Championships. A picture of Ole Bischof of Germany (blue) attacking during the Beijing judo final and winning the gold medal used on the first page of the German Judo Federation London Olympic team website presentation. The other four Finch photos of Germany's Olympic gold medallists competing in the Moscow, Los Angeles, Atlanta and Athens Games were used on the same website. JudoPhotos poster pictures used at the 2013 Rio World Championships Gala Dinner and Hall of Fame presentations. About 20 pictures of World nad Olympic champions were used all around the hall and these show (L-R) George Kerr CBE, Ryoko Tani and Kosei Inoue. The Ichikawa Judo Club with a JudoPhotos picture of French Olympic champion, Lucie Decosse throwing for ippon at the 2009 European Championships. Mark Huizinga of Holland (blue) throwing for ippon on his way to his Sydney Olympic gold medal. British Judo Magazine featuring a picture of Angelo Parisi throwing for ippon at the 1984 Los Angeles Olympics. Four of the eight pictures in this photograph were by David Finch and enlarged to two metres tall from 35mm negatives taken in the seventies and eighties and displayed at the Lausanne Olympic Museum in 2011. This was to celebrate the sixtieth anniversary of the formation of the International Judo Federation (IJF). As above, David Finch pictures displayed at the Lausanne Olympic Museum in 2011. The 2008 Beijing Olympic Opening Ceremony. Pictures of the Ceremony can be bought at www.judophotos.com . The Beijing guards keep the road free of people to allow Presidents Bush and Putin to drive past a little later. Part of the Beijing Olympic Opening Ceremony. "The man behind the camera". David Finch featured in a 1997 magazine shortly after the Paris World Championships. Times header with a picture of British visually impaired double World champion, Ben Quilter, throwing his opponent during the 2012 London Paralympics where he won a bronze medal. 2006 April issue of the USA Strength & Conditioning Journal used a front cover picture from the final of the Athens Olympics 90kgs division when the Georgian, Zurab Zviadauri, threw Hiroshi Izumi of Japan for ippon. The publisher then carried the same front cover on its Japanese edition probably to the great dismay of Izumi. This picture and others from the Athens Olympics can be bought at www.judophotos.com. Times double page picture of Ben Quilter being led onto the mat on the first day of the Judo Paralympics at London 2012 where he won the bronze medal. Quilter was a double World champion and expected to fight for the gold medal but had a pre-existing injury that prevented him from being at his best. 2006 front cover of British Judo's April issue of Matside magazine featuring Michelle Rogers at the annual Paris Tournament. This picture can be purchased from www.judophotos.com. The Buta Palace, Baku, Azerbaijan where the IJF Hall of Fame Gala Dinner took place on the 18 September 2018. Brian Jacks was the 1981 Superstar champion who recently visited the UK in 2018 to promote his new book "Mindset of a Champion" and was featured in The Sun and many other papers during his travels. Sally Conway of Great Britain celebrating her bronze medal victory at the Rio Olympics featured on the BBC website. Sally Conway of Great Britain celebrating her victory during the eliminations at the Rio Olympics featured on the BBC website. A Finch photo of Ashley McKenzie photographed before the London 2012 Olympics and featured in The Sun newspaper. British Judo Association website in 2013 featuring a picture of London Olympic bronze medallist, Gemma Gibbons, after she won the Dusseldorf Grand Prix gold medal that year. November 1975 British Judo Magazine featuring a Finch photo from the 1975 World Championships that would later be used by the Slovakia Post Office on a stamp to promote the 1999 Bratislava European Judo Championships.